My Name Is Abner & I Was A Swimmer Pup!! Do I Have A Swimmer Pup? First & Foremost let me say that I am NOT a vet. Nor do I pose to be one. It is only my intent to share with you the knowledge I have learned through the experience I gained while caring for Isaac (NKA Abner), who was a Swimmer pup born here at Highborn Havanese. I have learned that this syndrome looks much worse than it is. But if you take some time and pay special attention, you might be able to figure out if your pup has this condition. If you are a watchful puppy breeder, then you will know your pups better than anyone else....including your veterinary. You will always want to listen to the advice of your vet but if you feel like something isn't quite right with one of your puppies and your vet thinks you are overreacting or doesn't know what is wrong, you might want to get another vet. As a breeder, you want to work hand and hand with your veterinarian. You want him/her to advise you but they will also need to listen to you because you know your pup. In my case with Isaac and now, having been in touch with other breeders who have had Swimmers, neither my vet nor their vet knew anything of the Swimmer condition or how to treat it. That is scary. 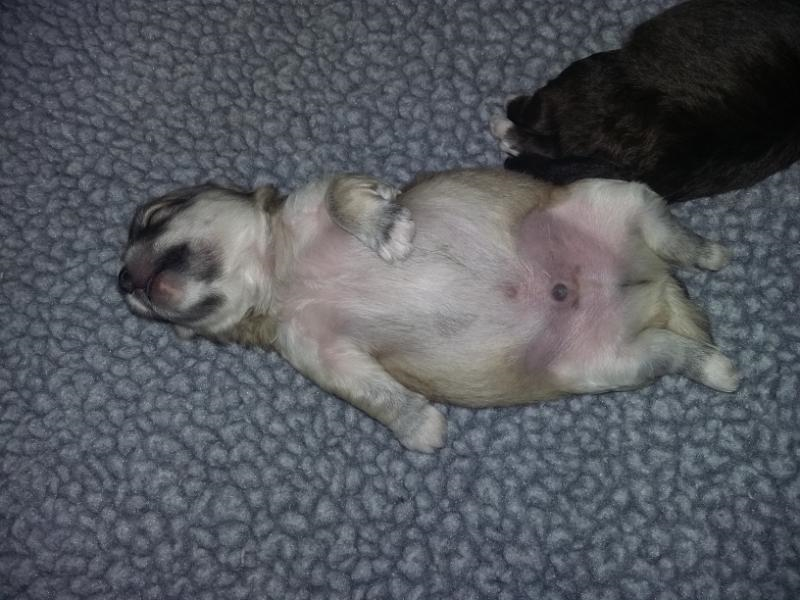 ​In the case of a Swimmer pup and my case with Isaac, I had what seemed to be a normal litter of three. We had a normal birth and the first 10 days after were uneventful. Around day 14 the pups eyes were beginning to open their eyes and that's when I began to notice a difference. Pups in a litter should all follow suit. In other words, when the first eyes open then the eyes of the siblings begin to open in tandem after. When the first pup begins to push up to walk, all the others should shortly follow suit. In the case of my "I" litter Izzy & Indy began to push up and walk but Isaac could only try to push up but his feet (all 4) would splay out to the side of him leaving him laying flat out on his chest. The one thing that was important at this time was that emotionally & mentally Isaac was no different from his brothers. He was acting just like them so he had no signs of sickness. He cried when he was hungry, he was aware of his surroundings. He just couldn't walk. Another important fact about Isaac was he was fatter than the other pups and when I checked the log book his weight had steadily increased till he was outweighing his brothers. At birth, all the pups were about the same size. I was told to pay attention to where he was eating and sure enough he found the best working teat and he always went to the same one pushing his siblings out of the way to get to it. It is very important that you make sure your Swimmer is drinking from different teats. ​I didn't think to take too many pictures but I found some old videos that I took. Below is a video of Isaac at 4 weeks old. The soonest the Specialist could see us which was the next day after this video was taken. So, how I had Isaac hobbled and wrapped was from what I learned online. All four of Abner's (Isaac's) legs were affected so he is in a jacket to keep his chest up off the floor...in either case, I was thrilled that the Dr. (Dr. Duval) asked me where I learned to hobble and informed me that I had done a fabulous job!! He gave me some further pointers on hobbling, which I pray I never have to use...but am happy for the knowledge if I do. The jacket that Isaac is wearing is very simple to make. I took a cotton T-Shirt and cut a square piece out of it. The size will depend on the size of your pup. I cut 2 holes in it to stick Isaac's legs through it. and I tied a knot at his neck and a know across his back. Then I stuffed the chest area full of cotton. Enough cotton so that when he would lay down he would roll to his side. It also helped him to push up with his front legs and gave him support. Like I said it was hard to watch and I cried alot but his front legs got strong quick so we lost the jacket and began working on strengthening his hind legs! Now, in this video Isaac is 26 days old. His siblings were up and had a pretty normal gait for pups of that age. Isaac at this point had been hobbled off and on for a week. 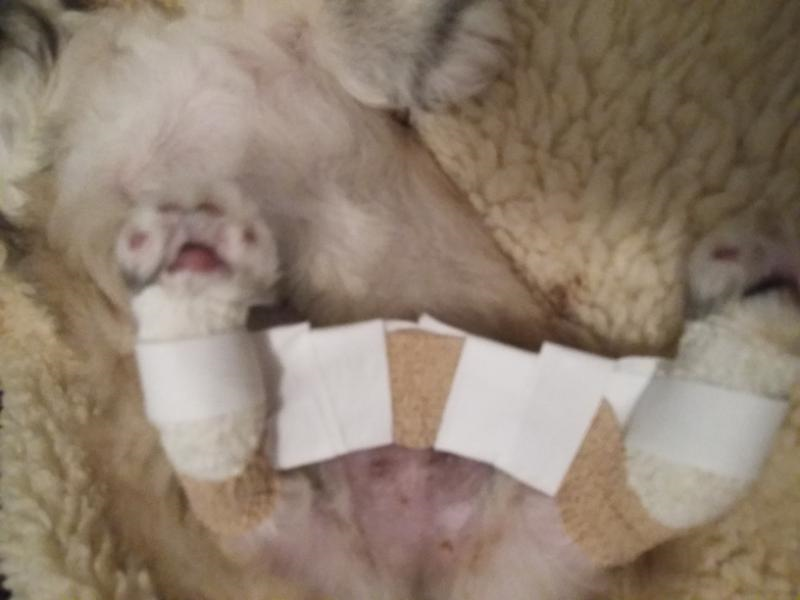 If I am honest I will say that I took the hobbles off after the 3rd day because it was too hard to watch..I had been to my vet who said she had never heard of such a thing so doubting myself I took the hobbles off....but once I put them back on and kept them on, he got stronger and stronger. I thought my eyes were playing tricks with my mind but Dr. Duval at Georgia Veterinary Specialists really encouraged me. If you keep your pup hobbled...even if it makes you cry ...do not take them off!! He will recover slowly at first and then he will be up and walking. In our case, once we stayed the course, it took about 2 weeks!! I will show another video later where it is only a few days after his appointment...and he is clearly walking better. <--You can see that Isaac is chubby & it would be difficult for his little legs to lift his weight.